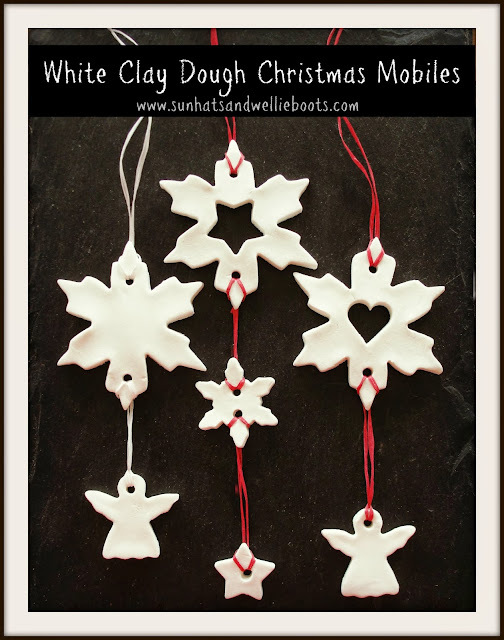 We've made many versions of white clay dough before but we found this particular recipe was the best for making ornaments. 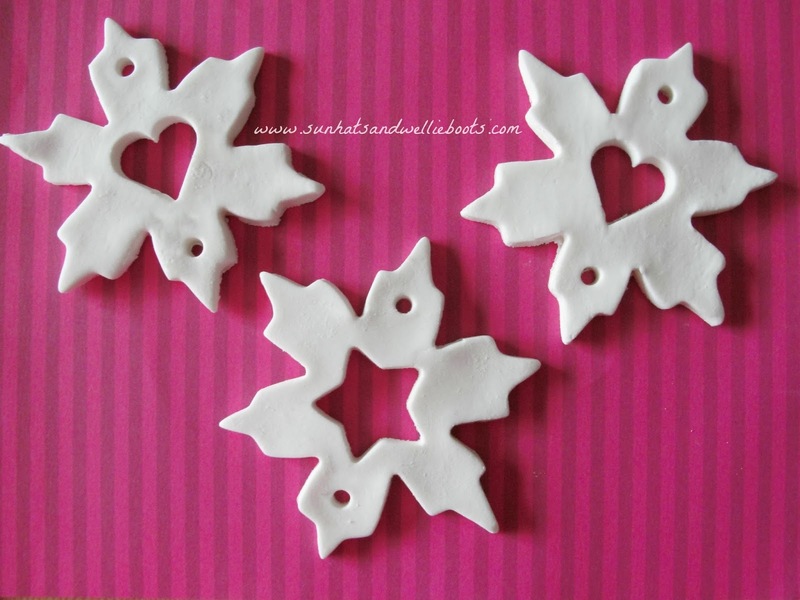 Other dough mixtures have cracked very easily while drying, but this recipe from Growing a Jeweled Rose created almost no cracks in the ornaments. We used their Snow Clay Recipe which gave our clay dough a great scent too. Follow the link to the site for recipe & instructions. Once our clay dough was cool we gave it a good knead. Minnie loved the soft smooth texture of this dough as she squeezed her fingers through it. When she had finished kneading it she rolled it out on a baking sheet sprinkled with cornflour to prevent it sticking. 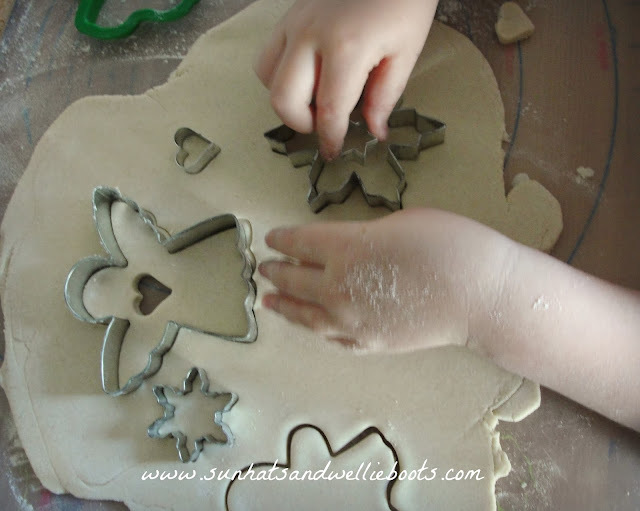 We found that our metal cookie cutters worked better with this dough than the plastic ones. We also discovered it was easier to add smaller shapes to the centre of the larger shapes while they were still in the cutters. When we tried to do this without the larger cutter the dough lost its original shape very quickly. Once all the seasonal shapes were cut we carefully added holes to the top & bottom of our shapes using a drinking straw for larger shapes & a cocktail stick for smaller ones. We used a palette knife to gently transfer them to a baking sheet & then left them to dry for 24 hours at room temperature. During that time we turned them over several times so both sides could dry. Top Tip! 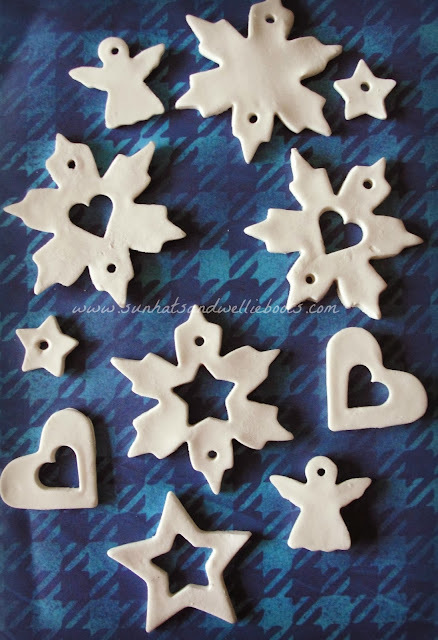 If you do find any cracks in your dry clay ornaments just gently rub some cornflour into them. The cracks soon become less visible, & some even magically disappear! To create our mobiles Minnie (with a little help) threaded lengths of thin ribbon & twine through the holes to make a loop. She then added her chosen shapes by looping the twine as before. We found it easier to add a larger shape at the top of the mobile & then smaller ones below. 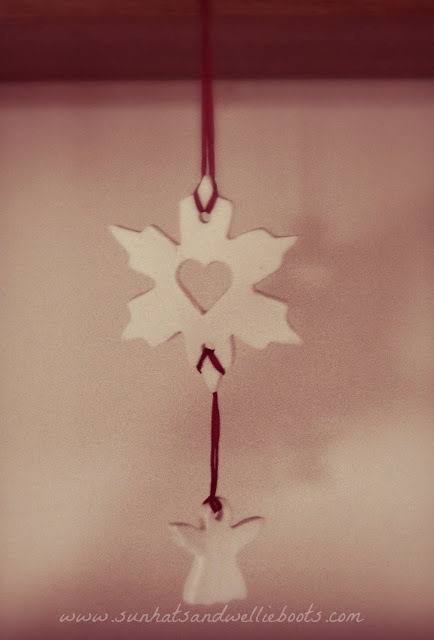 These make lovely tree decorations, & also look beautiful simply hung on the wall. We've had some of them hanging from shelves in our living room & they look so pretty as they twirl gently around. And when lit by nearby lights they produce lovely shadows too. Easy & fun to create, & a gorgeous homemade gift to receive.